Hanover/Friedrichshafen. At the IAA, ZF presents solutions that can help make trucks safer in inner-city traffic using a radar-based turn assist system to monitor the entire right vehicle side. The system tackles the challenge of blind spots presented by current mirror configurations. The driver is given a warning as soon as other road users approach the blind spot or collision zone. This will be further developed into the Side Vision Assist system, which will additionally incorporate camera images. Thanks to intelligent algorithms and interconnected sensors, this system can also actively engage the steering system and, if necessary, carry out emergency braking. This makes it an important building block for trucks with automated functions. When trucks that are driving in inner cities are involved in accidents during turning, these can have severe consequences. Incidents can involve vulnerable individuals such as cyclists and pedestrians. In the past year, there were 76 fatalities and over 3000 injuries in Germany alone according to the German Statistics Office. To help prevent collisions during turning even more efficiently, ZF is developing its turn assist function into an active system. The Side Vision Assist system can not only warn drivers, but can also intervene and initiate emergency braking or avoidance maneuvers if necessary. To accomplish this, the Side Vision Assist system uses several cameras in addition to radar sensors to recognize movements and identify pedestrians and cyclists. 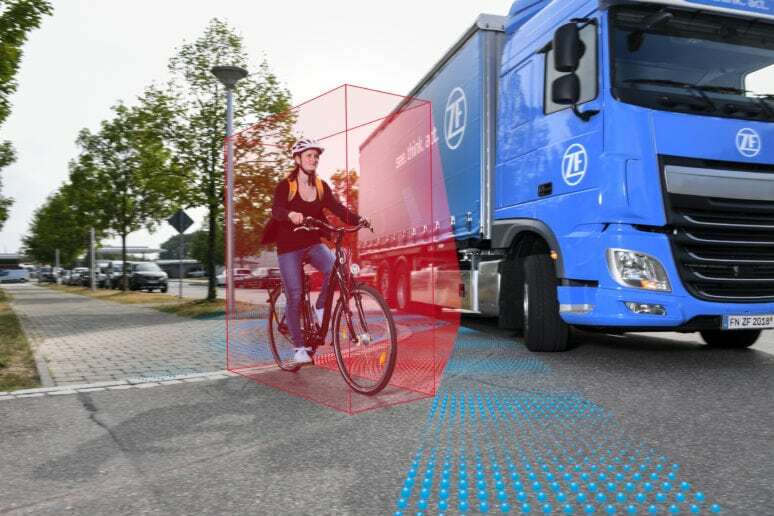 By doing this, the system creates a comprehensive view around the truck arranged in one display, a decisive advantage for drivers, as they now receive important information which they previously would have gained only by using six separate exterior rear-view mirrors.